Would you listen to Unraveled again? Why? 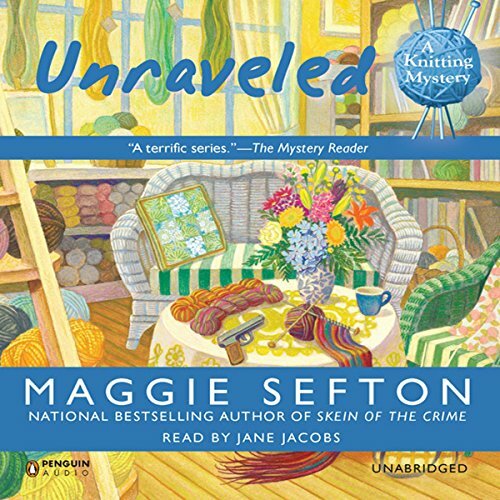 I'm an avid knitter and have been waiting for Ms. Sefton's books to be released in audio format. I only hope more of this series is soon in audio format. Loved it. Fast moving story. Well narrated. I enjoyed following the different side stories of the other characters. Could not get into this book because of the poor performance of the narrator! Dor yourself a favor and skip this one. Loved this book, nice flow and easy to listen to. Maggie Sefton is one of my favorite authors. Looking forward to reading more!! very good cozy. more in audio format please. This i a very nice cozy series, with likable believable charaters and nicely twisted plots. I hope we will get more in the sereise available in audible soon. As a romance novel this barely works. As a mystery it doesn't work at all. So if, like me, you're a mystery fan, then I'd give this one a pass. Maggie Sefton handles narrative okay, but her grasp of dialogue is non-existent. I was looking for a cozy mystery with interesting characters, a twisty plot and nothing too gruesome. Well, it's not gruesome, but it's also not interesting in the least. Imagine you gathered together a bunch of members of a cult in which no one was allowed to say anything bad to or about anyone but one not nice member. You put all the benign people around a quilt frame to sew except the bad person who was, happily, dead. That is this book, and the narrator doesn't help. Her narration does go with the book, but that's unfortunate. She keeps it so chipper and upbeat, she and the book become worse than boring--they are unforgivably, obnoxiously perky. I am an avid knitter so was very excited to find a mystery novel with knitting woven in (excuse the mixed metaphor). However, I found the story so drawn out and boring that I can't make myself listen to the end. I can't even be bothered to skip to the last chapter to find out 'who done it'. Perhaps if you are a fan of the series and have an existing relationship with the characters you would enjoy this, but I didn't like it at all. What disappointed you about Unraveled? Who would you have cast as narrator instead of Jane Jacobs?